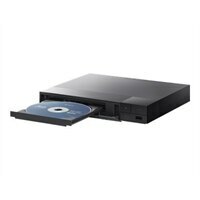 Stream and browse easily with the BDP-S3700, a Wi-Fi optimized Blu-ray disc player that plays online shows and media seamlessly in high definition. Experience bright, high-quality detail across everything that you watch - including DVDs, Blu-ray discs, and streamed online content. You'll experience smooth video streaming and responsive browsing. Just plug your USB drive into the port to share songs, photos and multimedia content with your TV.